The Cactus Wren darts across the cracked earth to a fallen cactus joint, lifts it with the side of his bill, spies a tasty ant, and quickly devours its snack. In the heat he holds his bill open as if panting and lifts his wings for ventilation. Building several nests but living in only one, the Cactus Wren uses the others as decoys designed to confuse his natural enemies. The Saguaro, or Giant Cactus, is the largest cactus in the United States, occasionally attaining a height of more than 50 feet and developing as many as 50 arms. Large individuals are believed to be from 150 to 200 years old. 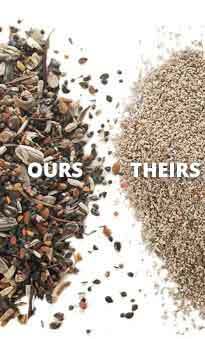 The Saguaro has contributed substantially toward the subsistence of Arizona's Pima and Papago Indians, furnishing materials for food and shelter. 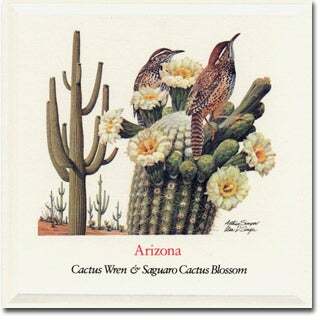 In spring, delicate white flowers with yellow centers and a brilliant satiny sheen bloom on the tips of the Saguaro's upward-curving branches and stem. 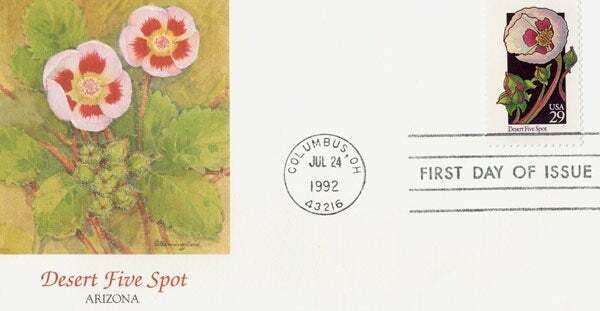 Arizona Wildflower - Desert Five Spot Art from the 50-stamp series, State Birds and Flowers, Issued April 14, 1982 simultaneously in all state capitals.